Unfortunately, adults aren’t the only ones who suffer from depression. 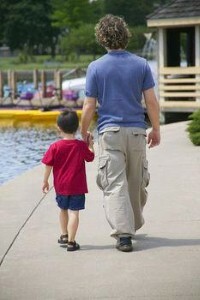 Fathers and mothers should know that young children can have both short and longterm bouts with the disorder too. A recent study published in the Journal of Child Psychology and Psychiatry revealed that almost 15 percent of preschoolers have unusually high levels of either depression or anxiety. The study took place over the span of five years and researchers also discovered that kids with moms who are depressed are more likely to become depressed themselves. The study was conducted by universities in the U.S., Canada, Ireland and France. "As early as the first year of life, there are indications that some children have more risks than others to develop high levels of depression and anxiety," says Sylvana M. Côté, a professor at the University of Montreal. According to the Mayo Clinic, symptoms of depression include crying spells, problems sleeping, irritability and feeling physically weak. One piece of parenting advice is that fathers who believe their son or daughter might be suffering from depression should look out for these warning signs, especially if their child’s mother has a history of depression. Another important indicator of depression in young children is their behavior when they’re 5-months-old. The study found that children who were already of a difficult temperament at this age were more likely to experience depression than children who weren’t.